​Fall is here and the days are already getting shorter. If you’re like most folks struggling to get quality horse time in between family, working and life in general, you’re probably feeling the pressure of these short days – especially if you compete or stay active with your horse throughout the fall and winter. While there may be less daylight to fit in actual riding, there are a few things you can do that will help to keep your horse tuned up, and keep you feeling less stressful. While most folks think of ground work as something only for young horses, it’s actually a terrific tool for seasoned horses. Ground work not only helps keep a horse responsive, but it helps their body to stay freed up as well so that they bend and balance much easier. Things like lateral work, working on bending from the ground, and fine tuning foot work can maintain or help a horse’s ability to perform. Horses learn through repetition instead of quantity of time. The great thing about ground work is that you can get a lot accomplished in even 5 minutes. If you incorporate ground work into your turn out routine, you can fit a ground work session in twice a day when turn your horse out, and when you bring your horse in. In years past when I was breaking colts, I would do ground work every time I took them in or out, and sometimes even while they were eating. 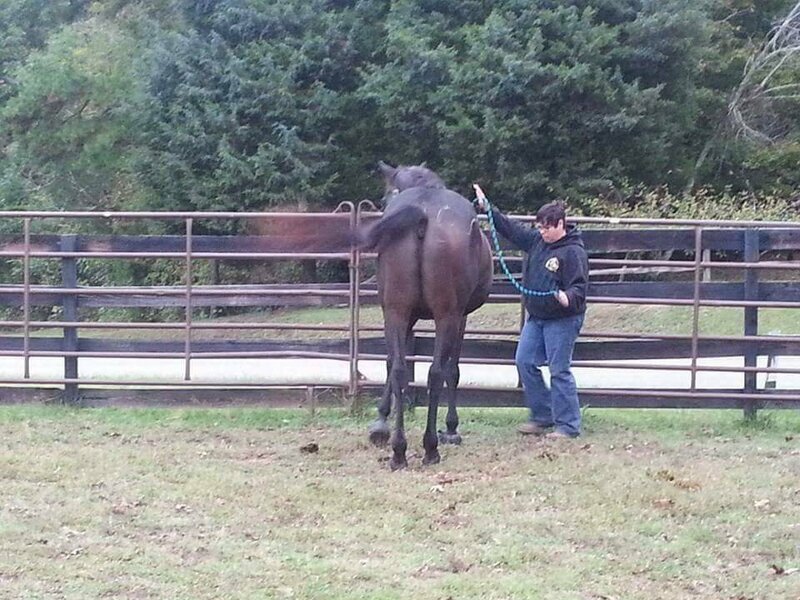 Not only did it make the breaking process go much quicker, but it also cut down on boring round pen sessions. My general rule of thumb in incorporating ground work into turn out time is to ask for one to two moves each session. If they do a great job of what I ask on the first try, I quit right then and turn them out. If they struggle, I’ll aim for asking no more than 3 times and quit on their best effort. That way they don’t get over-schooled and get irritated. You can use the actual turnout as a reward after ground work. More laid back horses will usually try a little harder and will get lighter in their efforts when working when they realize they get to go out. For a more nervous horse, you can delay the turnout so that they don’t anticipate. Those types of horses, I’ll wait until I feel them relax before I quit and let them loose. Although the work is very short, just a few moments, because it’s consistent and on a routine, they catch on very quickly. It’s a good way to set them up for success. While you may think that actual ride time is the only way to ultimately improve or maintain your riding, the right type of exercises can have a huge impact on how well you ride. 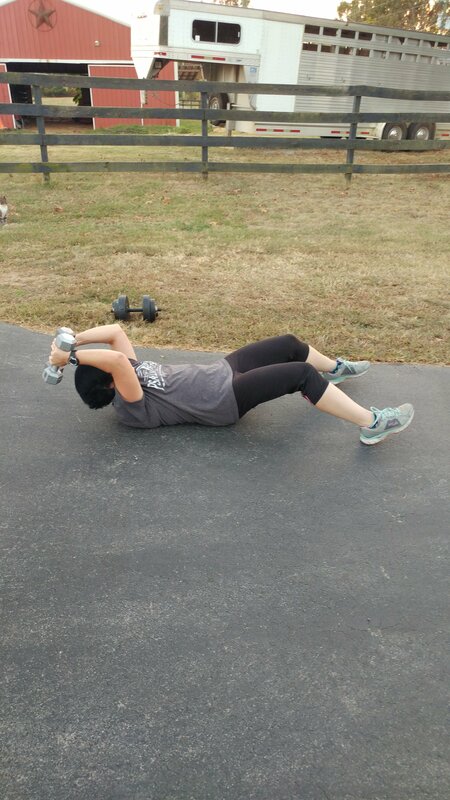 Planks with weights and kettlebell exercises are some of my favorite exercises to help maintain core strength. If you feel you’ve gotten in a rut with your exercise routine, try to find new positions or moves that reveal body weakness. Just like patterns reveal weaknesses in our horsemanship, changing a position or trying a new exercise can reveal weaknesses in our bodies. It doesn’t necessarily take a big change, sometimes just a change of angle will work completely new muscles in a different way. A big part of riding comes from the mind. Shorter days and grayer skies can play havoc on our mindset. Seasonal Affective Disorder (SAD) is a real condition that affects many people throughout the fall and winter. To help combat the winter blues and keep you motivated and focused, be sure to fuel your body with foods that help support your brain. Foods high in vitamin D can help improve mood. Also, pay attention to gut health as recent studies suggest that probiotics can have a significant impact on depression and anxiety. Eating plenty of green, leafy vegetables also helps to keep a healthy intestinal tract that encourages the growth of good bacteria. Finally, don’t be afraid to just take a break during the winter. Horses and riders both usually come back better and more dedicated after a break. There’s a lot of pressure out there to ride through the winter, that if you don’t ride you’re not a real horseman or cowgirl, or you’re not dedicated. That’s just not the case. Horsemanship is not about riding the most, it’s about doing what’s right for the horse and keeping your horse where they want to work. You have a limited amount of rides, make the most of them. Sometimes that means taking a break. Plus, if you are giving your horse a break that gives you an opportunity to focus in yourself a little more. Use the time to exercise and find inspiration. Do you feel pressure to get a lot done as the days get shorter? How do you deal with those feelings? What are ways you can start to feel less pressure when it comes to being a rider? 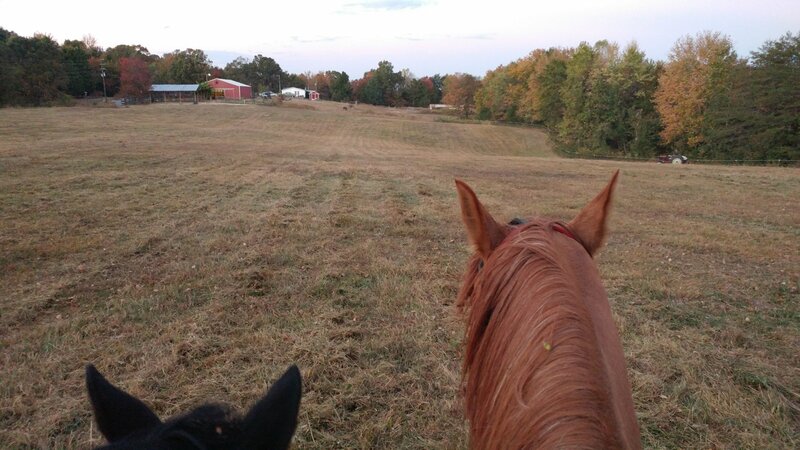 This entry was tagged cold weather, fall, fitness, horses, mental health, riding, winter. Bookmark the permalink.